Background and Objective: Epidermal growth factor receptor (EGFR) gene mutation, especially in exons 18 to 21, is an important predictor of the response rate of lung adenocarcinoma to tyrosine kinase inhibitors. 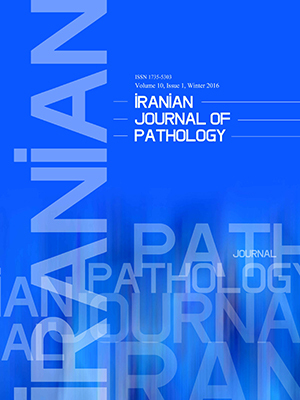 There are variable reports from Asian and European countries, as well as North America, about the frequency of the EGFR mutation in lung adenocarcinoma, yet molecular study about this incidence has been published from Iran. In this study, we investigated the frequency of this mutation in our center, which is the largest referral center in the south of country. This report will be the first published article about EGFR mutational analysis from Iran. Methods: During the study period (September 2011 till September 2016) i.e. 5 years, there have been 50 cases of pathologically-confirmed lung adenocarcinoma. These cases underwent mutational analysis for exons 18 to 21 of the EGFR gene by PCR and DNA sequencing. All demographic findings were also extracted from the patients’ charts and recorded. Results: There were 30 male and 20 female patients, with an average age of 58 years. The overall frequency of EGFR mutation was 28% (14 out of 50). The most common mutation was Del 19 (10 of 14, 71.4%), 3 mutations were found in exon 20 and one mutation was found in exon 21. EGFR mutations were more frequent in women than in men (30% versus 26.7%) and in nonsmokers than in smokers (37.9% versus 14.3%). Conclusion: Lung adenocarcinoma with EGFR mutation shows strong association with female non-smokers. Our results showed an intermediate frequency of this mutation, which was higher than results from Western countries and lower than most Asian countries.